Virtual reality Star Wars is everything. Who doesn't want to wield a light saber and be the ultimate badass padawan? 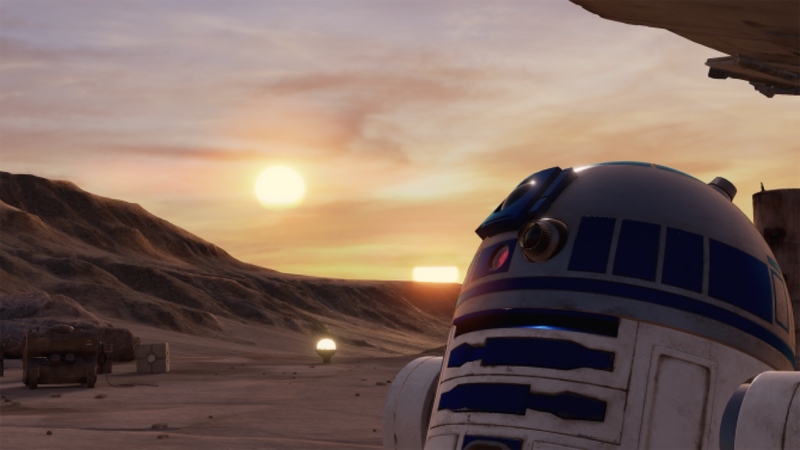 Made in Unreal Engine through a collaboration with Lucasfilm Story Group, ILMxLAB and Skywalker Sound, Star Wars: Trials on Tatooine is a short VR experience on the HTC Vive that lets you hang out with R2D2 while Han Solo barks orders at you from the Millennium Falcon. Oh and Chewbacca's around too, making Wookie noises. The scene opens with a traditional Star Wars crawl explaining just what the heck you're doing on Tatooine. There's no spoilers or tie in to the new films. Rather it's a stand alone, room-scale Vive experience that lets you bask in the light of two suns making you wish it was all real. The demo giver for my session, John Jack, was part of the development team as director of production at Lucasfilm and helped create the experience. He said it really began as an experiment to see what would gauge the audience's interest - as if anything Star Wars wouldn't. The opening sequence where the Millennium Falcon looms over you as it lands was pretty much the entire demo at first, which is already impressive itself since the ship is gigantic and frighteningly close to you. Because people loved it so much, the teams kept at it and created Trials. The demo then has you push a bunch of buttons to help Han and Chewie take off again as R2 chirps at you nearby. The experience only requires one Vive controller which in VR, looks like a little tool you'd find lying around a Jawa junk heap. The best part? R2D2 hands you a lightsaber that's from Luke Skywalker himself (well, produces it from his tin can body since R2 doesn't have hands). At this point, I nearly swooned. Patting R2D2's noggin as he booped and beeped at me was already amazing enough - I was not expecting the noises, effects and tactility of the lightsaber to feel so real. Several Storm Troopers show up and in typical fashion, had horrible aim. Thankfully, this gives you time to figure out how to send the lasers zooming back, effectively taking out several troopers. Han and Chewie shoot down the remaining clones and you're left to your own devices slashing about with the lightsaber as the end credits roll on - because why not? The positivity garnered from this experiment will likely push ILMxLAB and co., to continue making epic VR adventures, after all it is named "Trials." They won't be actual games, especially since Jack said the focus was on story for this demo. After trying it out for myself, I don't care if it's a game or light hearted experience. As long as it's interactive VR with lightsabers, I'm sold.